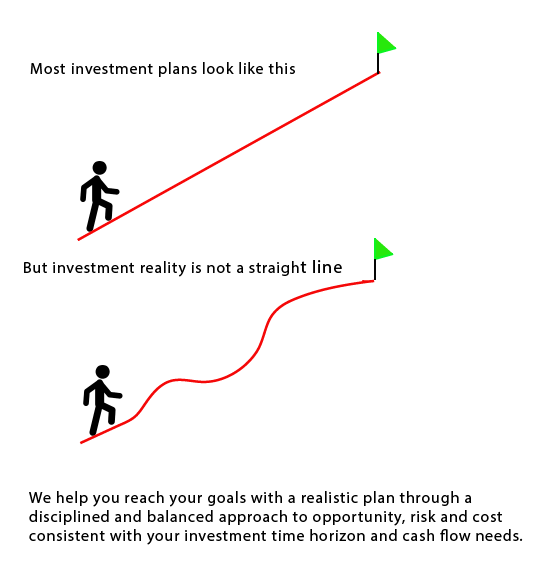 Setting your life financial goals and an investment portfolio path likely to reach those goals is fundamental. Determining how much investment risk you can take within the portfolio path is a critical decision. Two important dimensions of investment risk are: Risk Capacity and Risk Appetite. Risk Capacity refers to the extent of volatility, maximm drawdown or permanent loss you can withstand without having to significantly change your present or future spending patterns; and to your ability to avoid emotionally driven investment changes to your portfolio path in the face of adverse conditions. Risk Appetite refers to your tendency to assume risk exposures. If your risk appetite is much less than your risk capacity, you will miss a lot of return over your investment career for no good reason. However, if your risk appetite is much more than your risk capacity, you could experience results that reduce the probability of achieving your goals; and possibly impair your current or future standard of living. Matching your Risk Appetite with your Risk Capacity is a fundamental part of sound investing. 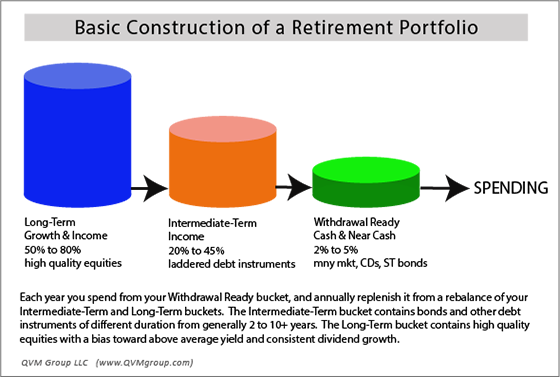 To reduce the bumpy ride, by providing a reliable source of ready cash for withdrawal, and the ability to avoid selling stocks in a volatile or down market, your retirement portfolio should be put together in segments, as illustrated in this image. The tables below will help you think about the balance of stocks and bonds that may suit your personal risk profile within your segmented retirement portfolio. "The essence of investment is management of risk, not management of return"
These historical allocations between total US stocks and total US bond indexes are a valuable tool to help you evaluate your personal goals in terms of how those allocations have worked out in the for the markets in the past. The past is not the future, but knowledge of the long-term past is important to understanding some of the possibilities for the future; and to developing a realistic understanding of your return objectives in terms of the historical associated risks. We manage to individual client goals and limits, not to hypothetical or institutional benchmarks. We seek client specific adequate total return and required income within tolerable risk. We are also mindful that the most important decision is the allocation between major asset classes, with security selection within reasonable bounds being important but of secondary importance to major asset class allocation. Therefore, we begin each client relationship, and regularly review with our clients, their comfort level with expected returns and risk levels. The two most important asset classes, other than cash, are bonds and stocks. Therefore, we begin our portfolio design process by helping our clients find their comfort level with the relationship between risk and return, by studying data like that shown in the tables below. They prescient several decades of return and risk results from 11 allocations between US bonds and US stocks. The first table present the calendar year return of 11 different allocations of US stocks and Aggregate US bonds for the past 10 years. 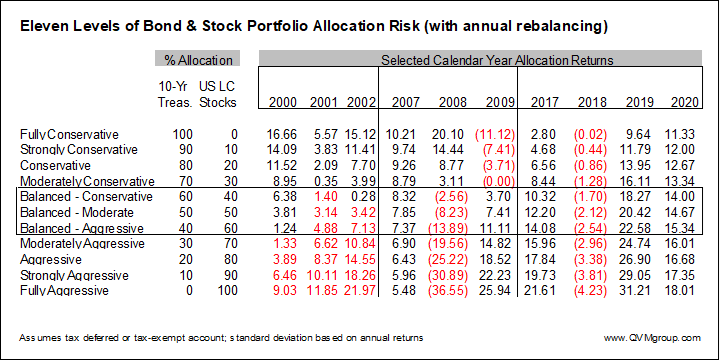 The second table presents historical returns for each allocation over different periods up to 40 years, and how often loss years have occurred. The third table presents the volatility levels for those allocations over 40 years. The last table presents the range of outcomes that might be experienced based on the 40-year mean return, and 1 to 3 positive or negative standard deviations from the mean. 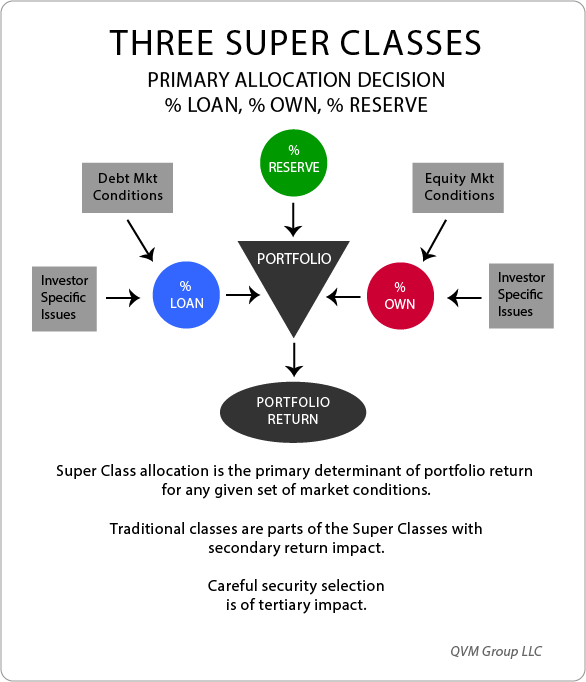 Our approach is to think of the portfolio allocation in terms of a 3-by-3 matrix consisting of the 3 Super Classes in one dimension, and 3 Portfolio Roles in the other dimension. Those 3 roles are Broad Core, Income Core, and Tactical Opportunity. 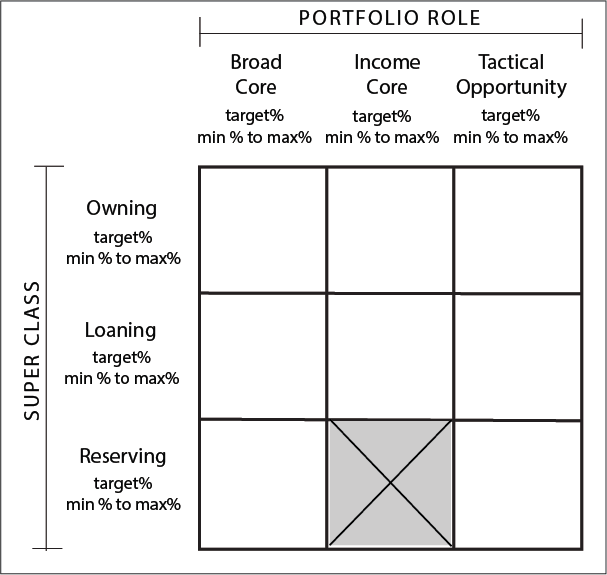 Everybody needs Broad Core, and some people need one or both of the other Portfolio Rolls in their allocation depending on their specific situation and preferences. BROAD CORE consists of widely diversified, good quality assets in at least the OWNING and LOANING categories. Those assets can be thought of as “quiet” assets. There will be adjustments to allocations among specific assets within each category and there will be occasional substitutions, but for the most part, the holdings will tend to be long-term. INCOME CORE is also diversified, but not as widely as the Broad Core, because in order to emphasize interest and dividend income, and dividend growth, it must own a subset of the overall market. This category is also fairly “quiet”, but not as “quiet” as the Broad Core, because substitutions along the way to obtain the most attractive income and income growth may be appropriate as markets change,. This category tends to be more suitable for mid-life and retired investors. TACTICAL OPPORTUNITY category is entirely optional in any portfolio, and only appropriate for those investors with an appetite for tactical actions. Tactical assets are not “quiet”. Opportunities arise, run their course, and are harvested (or stopped out), resulting in a temporary position in the portfolio. Sector rotation is an example of a tactical action. Rely on us to help you evaluate, design and manage your portfolio and investment risks in a way that is appropriate for you, at a fair and affordable cost. If you seek Quality, Value and Management in your investments and your advisors ... rely on us.